Outside of the summer months, the small fishing ports are delightfully quiet and calm. This beautiful Catalan coastal path in Spain starts in the shadow of the last foothills of the majestic Pyrenees mountains before heading into the Costa Brava. The coastal path passes through a variety of landscapes and sites as you alternate between hilly days with pretty rocky inlets, and easier days passing through bays with lots of wildlife interest. Your walking trail following the Mediterranean coast starts in Cadaques, a beautiful small historic fishing port made from white-washed houses nestling at the base of green hills. Our Pyrenees Coastal Trail walking holiday between France and Spain ends in Cadaques and so the two self-guided walking holidays can be undertaken together or one after the other as a continuous linear walking trail. Your first day passes around the rocky peninsulas and inlets of Cap de Creus and Cap de Norfeu. Secluded rocky bays nestle beneath picturesque headlands which offer great views across the clear blue sea. 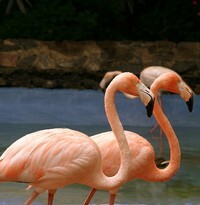 You'll then walk around the Bay of Roses, passing the Aiguamolis Natural Park. After visiting the ruins of the ancient Greek town of Ampurias dating from 575BC you'll pass around another headland above the sea with typical Mediterranean vegetation. Later in the week you'll get to explore the medieval village of Pals before climbing onto the wooded dunes known as the "mountains" of Begur. Further rocky headlands and bays lead you to the pretty bay of Llafranc. This self-guided or independent walking holiday is made up of 6 walks moving between hotels. The walks average about 19km with a maximum of 22km in any one day. Some sections of the trail are rough and stoney in places with the odd steep section. This walking holiday alternates between hilly sections going up and down past headlands and creeks and other easier sections around wide open bays. Daily ascents range between 25m and 600m with an average of 350m of ascent and descent per day. Arrival at Cadaques if travelling by car or transfer from Portbou train station if travelling by train. Cadaques is a pretty seaside port with its narrow winding streets and its traditional white-washed houses. Your first day's walk passes around the rocky peninsulas and inlets of Cap de Creus, which is now a regional park and Cap de Norfeu. Secluded rocky bays nestle beneath picturesque headlands which offer great views across the clear blue sea. At the end of the day you'll reach Roses an ancient Greek city, a seaside resort which mixes antiquity with the ultra-modern. Today you'll walk around the Bay of Roses, passing Empuriabrava with its kilometres of navigable canals before a much wilder area as you pass through the Aiguamolis Natural Park protected for its rich fauna and flora. Vital as a staging post for a wide variety of waterbirds, this network of freshwater and brackish lagoons, marshes, grazing meadows and rice fields is the site of a large variety of breeding and wintering birds. Follow the GR92 to reach St Pere Pescador. 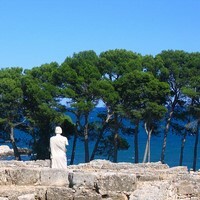 A shorter walking day allowing you time to visit Sant Marti d'Empuries, a medieval settlement, quickly followed by Empuries or Ampurias, the ruins of an ancient Greek town dating from 575BC and one of the earliest Greek settlements on the Iberian Peninsula. The site was later occupied by the Romans. You'll finish your day in l'Esala, a pretty fishing port with typical narrow alleyways. 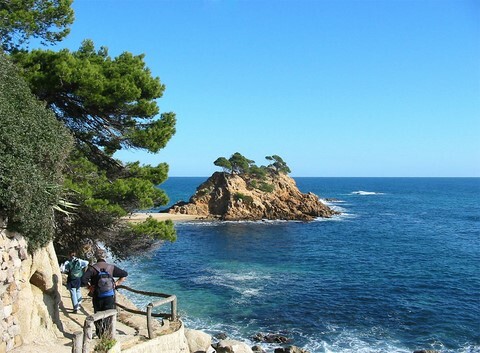 Todays walking trail along the Costa Brava coastline will take you over a headland above the sea before passing through typical Mediterranean vegetation and pine forests. You'll then climb to the remains of the castle of the Lords of Montgri before a beautiful descent brings you to the village of Torroella de Montgri which was once a port, but centuries of silting has left it high and dry. Today you'll cross a beautiful and wild section of the Catalan coast before you have a chance to explore the medieval village of Pals. This pretty hill-top village has been restored and you'll enjoy meandering along its quiant cobbled streets. You'll then climb slowly onto the wooded dunes known as the "mountains" of Begur, before reaching the resort town of Begur itself which is home to a number of historic sites. The last day on your self-guided walking holiday along the Catalan coast is a shorter walk for a last look at the blue Mediterranean Sea from the spectacular lighthouse Sant Sebastia which overlooks the sea from a height of 160m. 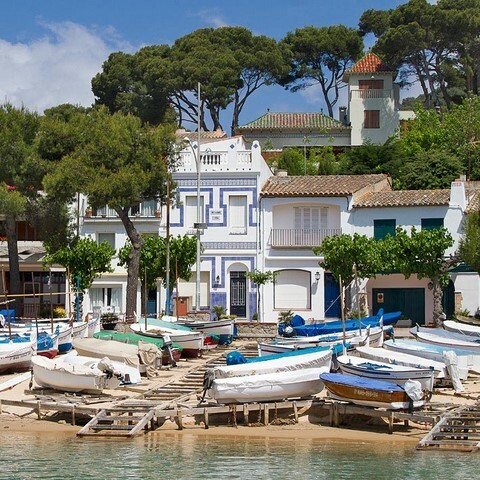 Descend to the pretty bay of Llafranc and the end of your walking holiday along the Costa Brava in Spain. Transfer to Cadaques or the train station in Girona. Transfers programmed for 14.30 towards either Cadaques where you started your Spanish walking holiday or Girona. Once you have booked on this independent walking holiday on the Mediterranean Coast, further information about the walking, the region and what to bring, will be sent to you. We do have a web page dedicated to what clothes and equipment you should bring. In addition, our travel shop has direct access to all the top walking and travel retailers. Please contact us if you need any further information. A variety of independent and friendly 2 and 3 star hotels on a half board basis. Lunches are not included in the cost of the holiday but can be ordered from your hotel, the evening before your departure. Eurostar, TGV and TER French trains allow access to Portbou train station in Spain from where you will be provided with a transfer to Cadaques. Changes between the Eurostar and TGV are at Lille, Paris or Lyon if you take a direct train. TGV's run from Montpellier, Perpignan or Figueres from where local train access Portbou. This journey will take more than a day for most options, except for early trains via Paris, as well as the early direct train from London to Lyon. Please use Rail Europe's train finder in our travel shop to organise your train journey. If you are flying to Barcelona or Girona (see below) then you can take regular trains to Portbou. There are 9 daily trains from Girona to Portbou and the journey time is just over one hour. There are also a large number of regular trains from Barcelona Sants to Portbou. Sometimes you need to change at Girona. Journey time is at least 2 hours. At the end of the holiday you'll be provided with a transfer to Girona (journey time about 45 minutes) from where main line trains run towards Barcelona and French cities. You can also have a transfer back to your start point of Cadaques. Please contact us before booking to check for practical times. There are international flights from most main airports to Barcelona. From the airport you can catch a train directly to Barceona Sants where you can catch a train to Portbou (see above). To get to the city centre you can also take several bus lines and the metro. There are also flights from French and UK airports to Girona airport. Operator Ryan Air have flights from several UK airports. There are shuttle buses into the city of Girona as well as to Barcelona, which are scheduled to coincide with the arrival of Ryan Air flights. For trains from Girona see above. At the end of the holiday you'll be provided with a transfer to Girona (journey time about 45 minutes) from where there are buses to the airport to coincide with Ryan Air flights. There are also regular train services to Barcelona. 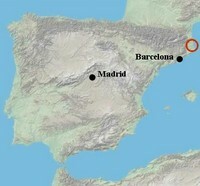 Once in France, the journey from Calais to Portbou or Cadaques in Spain takes about 11 hours (excluding long breaks). There is a car park at the hotel in Cadaques. Cost for the week is about 35 euros. Transfer at the end of the holiday from Llafranc to Cadaques (journey time about 1 hour 15 minutes).